U.S. Astronaut A.J. 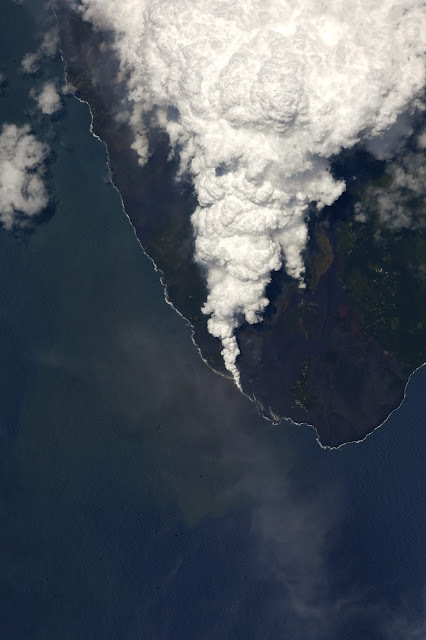 (Drew) Feustel: "We can still see the Earth’s fury from the International Space Station as the lava continues to flow from Kilauea. Expedition 56 is thinking of Hawaii as the dynamic Earth continues to evolve." Kilauea is a currently active shield volcano in the Hawaiian Islands, and the most active of the five volcanoes that together form the island of Hawaii. Located along the southern shore of the island, the volcano is between 300,000 and 600,000 years old and emerged above sea level about 100,000 years ago.